The most successful charities don’t communicate just to tell people about the change they make in the world. They communicate to make change happen. But third sector communications professionals often feel their work is undervalued. Few feel equipped to spell out how critical communications really are. 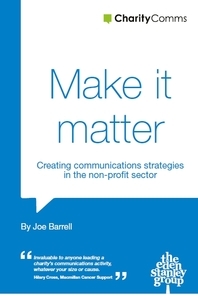 Make it matter helps communications professionals develop robust, outcome-focused strategies that will propel your charity forward to greater heights. Published by CharityComms and written by Joe Barrell, director of strategic communications agency Eden Stanley and former director of communications at Save the Children, Make it matter is rooted in the reality of working in a busy non-profit. Make it matter gives communications professionals in non-profits the tools and knowledge to develop a clear, compelling and effective communications strategy. It sets out the key decisions you need to make and offers a logical process to follow to develop a communications strategy that delivers. Based on interviews with communication directors and featuring case studies packed with expertise, inspiration and insight, learn from the best in the sector, including British Heart Foundation, Cancer Research UK, National Trust, RSPCA, Stonewall, World Vision and more. The print copy of Make it matter: creating communications strategies for the non-profit sector has now sold out. You can buy the ebook for £14.95. Contact Molly. It’s fantastic to see a guide that’s specifically aimed at the charity sector and not just theoretical but rooted in the real world. Make it matter takes a pragmatic look at the challenges and pitfalls you’re likely to come up against when asked to create a strategy. "A survival guide that is both constructive and pragmatic, to help you develop your own razor-sharp communications strategy."